Reading is a big deal in our household. Truthfully because I was not a strong reader as a kid and did not want the same for my children. I strongly believe if you can cultivate a love for reading, you are also creating a love for learning. This post does contains affiliate links, which cost you no more than you would normally pay and can read my disclosure here. One of the first curriculum I remember buying was Level 1 All About Reading. My Daughter Lilly at the time was an advanced 5 year old and flew through it. I loved watching her love the activities in the book and soar in her reading abilities. Excited to put sticker’s on the progress chart when she completed each lesson, reading and re-reading the story books (all over the house, I may add) and wanting to keep going on to the next lesson. I also fell in love with it due to the thoroughness of the curriculum. As a mom who did struggle as a child in reading it was vital that I got a curriculum that covered every aspect of reading. But at the same time easy to read as her teacher and not making me feel dump as her mother. This program exceeded all and more of my expectations. It is one thing to see You-tubers love it, but sometimes that hype is not all it’s cracked up to be. Not to mention this is a program that is not very cheap if you were to use it all the way through to level 4, compare to say, “How to Teach Your Child to Read in 100 Easy Lessons”, which is just one book. I will say now that I have used the pre-level through to now into the third level. It is worth every penny spent. Both my children thus far have loved it! This program teaches your child how to decode words that are not known to a child for than they can figure it out on their own – all the way to helping early readers with as simply as figuring out the difference between “b’s” and “d’s”. 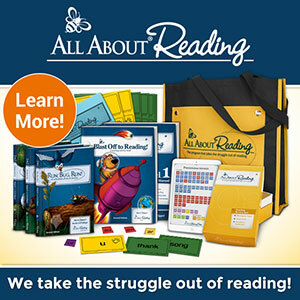 All About Learning Press has a great eBook to help letter reversal. With my son I did purchase the pre-level program and it was just what he needed at the time. As well as greatly prepared him to soar into level 1. I truly cannot say enough good things about All About Learning Press. They have great customer service if you need to ask them about anything. In side scoop, if you ask when ordering (can leave a comment at checkout) they will draw a picture on your box before they send it. Its super fun and the kids love it! If you have any questions about All About Reading let me know and I will answer it the best I can. This year we will be in Levels 3 and back in Level 1 for my son.